WearCheck couldn’t be prouder of diagnostic manager John Evans, who recently diagnosed his two millionth oil analysis sample. John diagnosed his first sample back in February 1983 when he worked for Barlows in Botswana. After a stint with De Beers in Botswana, also in the oil analysis field, John joined the WearCheck team in 1989 as a diagnostician. His promotion to diagnostic manager in 1997 meant his workload included a bit more admin, however, this did not slow down his sample diagnosing! Not only has John clocked up the impressive sample diagnosis count, he has also authored more than 30 of WearCheck’s ever-popular Technical Bulletins. Many of John’s articles on condition monitoring have been published, and he has devised many of the company’s customer training manuals. John has also published a book on oil analysis. 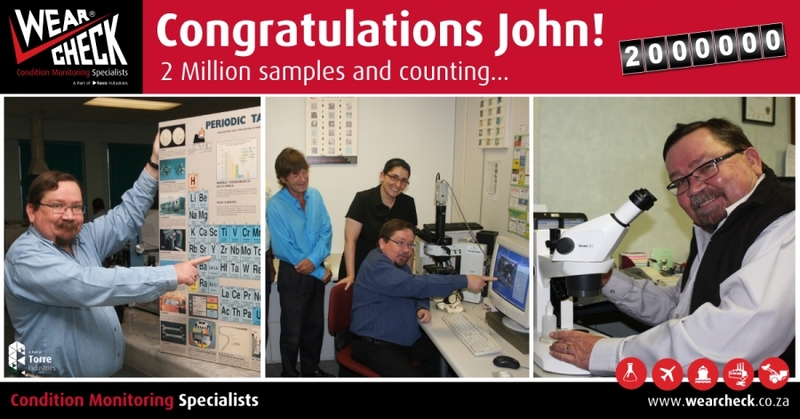 Whilst we don’t have official statistics, we do know that it is extremely rare on a global level to have diagnosed this quantity of samples, therefore John’s achievement aligns him with only a handful of top diagnosticians globally who have reached an equivalent milestone – among them, fellow WearCheck diagnosticians Michelle Allis and Rowan Maartens (recently retired). 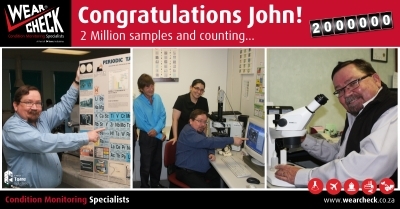 Caption: WearCheck’s diagnostic manager John Evans recently diagnosed his two millionth oil analysis sample, ranking him alongside only a handful of top diagnosticians globally who have reached an equivalent milestone – among them, fellow WearCheck diagnosticians Michelle Allis and Rowan Maartens (recently retired).